Ever notice a tiny leak mysteriously coming from the bottom of your vehicle? Or that you’re suddenly having a much harder time steering your car no matter what speed you’re at or the road you’re on? If you’ve noticed any of these two signs, then it’s likely that you might be dealing with a power steering leak. It is important to understand that while a power steering leak is not an urgent problem, it is still one that can lead to dire consequences if you leave it unfixed. Of course, determining whether it is a power steering leak issue or not comes first in order to find your possible solution. Leakage is one of the most common issues in power steering systems. Depending on the type of steering system you have in your vehicle, you will have to deal with different types of fluids. Viscosity or thickness of the fluid has to match the pump design of your system. Others need certain additives in the fluid to stop oxidation. Regardless of the fluid type that your vehicle is using, chances of leaks are still possible. In order to fix your power steering leak, try to pinpoint the source first and foremost. Check the power steering pump itself. Locate the point where the pump shaft ends and where the pump pulley is connected. Check if there is some leak behind or under the pulley. If this is the case, you may have to replace your steering pump. Check the hoses and tubing that carries the steering fluid from the pump to your steering rack. Check the connectors and see if the screws are missing. If the problem is on the hose, wrapping the hose with some Teflon could temporarily fix the leak. Inspect the hoses and hard pipe. Check the connections and try tightening the connections if loose. Inspect the steering rack assembly. Lookout for damp steering gators (rubber boots), which may indicate that the main seal has failed. Another common failure is the top seal where the steering rack meets the column link near the bulkhead of the engine bay. Inspect the low-pressure pipes & reservoir. The low-pressure pipes run from the steering rack, back to the reservoir. If you discover the steering leak whilst driving, providing it is not a heavy leak and has not caused the steering to go heavy or noisy, you may continue on your journey with caution. 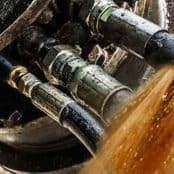 However, it is recommended that you keep a close eye on your vehicle, as a small leak can only cause a bigger leak that can further quicken the process of you losing all of your fluid in a short period of time. Driving with a leak for extended amounts of time can lead to damage to your steering pump as well, due to the high friction and heat caused by the dry pump. When the pump runs dry, metal shavings may come off the pressure plates due to the friction and enter the steering system – the end result will be a failure of the steering rack and contamination of the entire steering system, which will then need to be flushed thoroughly and the repair can become quite expensive. 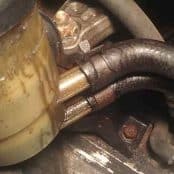 A power steering leak is not a panic-worthy issue, however, it is a problem that should be dealt with immediately once spotted. While there are quick fixes for this type of problem. Using stop-leak treatment fluids will only serve as a temporary solution to your problem. Not only that, these solutions could cause fluid contamination in your vehicle. It is highly recommended that you visit us and have the issue properly dealt with by Power Steering Professionals who know how to search for the leak and fix it. We have the facilities to remanufacture a leaking steering pump, leaking steering rack and a leaking steering box. If the leak is coming from one of the power steering pipes, we can also repair them as well for most makes and models. Tags : Can I still drive with a power steering leak, fluid leak on car, leakage in vehicle, power steering leak.